What is Unit of Measure (UOM) and how to create it? 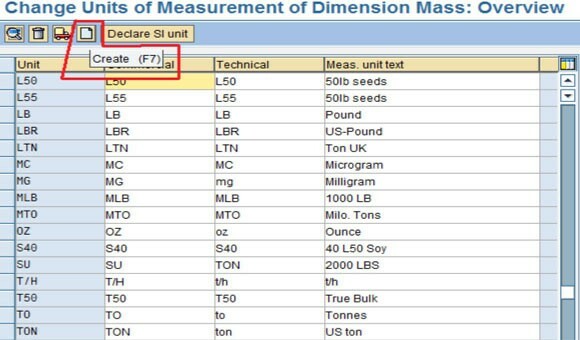 In SAP to measure the quantity of the material unit of measure is used. In other words unit of measure is used to express the quantity. for example, weight is a physical quantity. The Kilogram is a unit of weight that represents a definite predetermined weight. A unit of measurement that can be determined by taking one measurement without having to combine any other measurement. Length, mass, and temperature are examples of base units. A unit of measurement that is determined by combining one or more measurements. In short all units of measure other than the base unit of measure are referred to as alternative units of measure. T-Code to create Unit of measure is CUNI. Goto SPRO->SAP Netweaver->General Settings->Check Units of Measurement. ISO code is used for Electronic Data Interchange (EDI). It is used for converting the SAP internal units of measurement into standard units of measurement. The Create Button needs to be clicked. Save it after maintaining as required. in a case where a material is 0.1kg, and the base unit of measure is EA will this be 0.1 ea?